Very cool! What kind of station? Nice Jeeps! Bet half the fun is getting there. Do you use a battery-backup for nightime? Would also like to know your APRS ID. I am associated with a similar station using a Davis Vue located at Carson Pass on CA Highway 88. 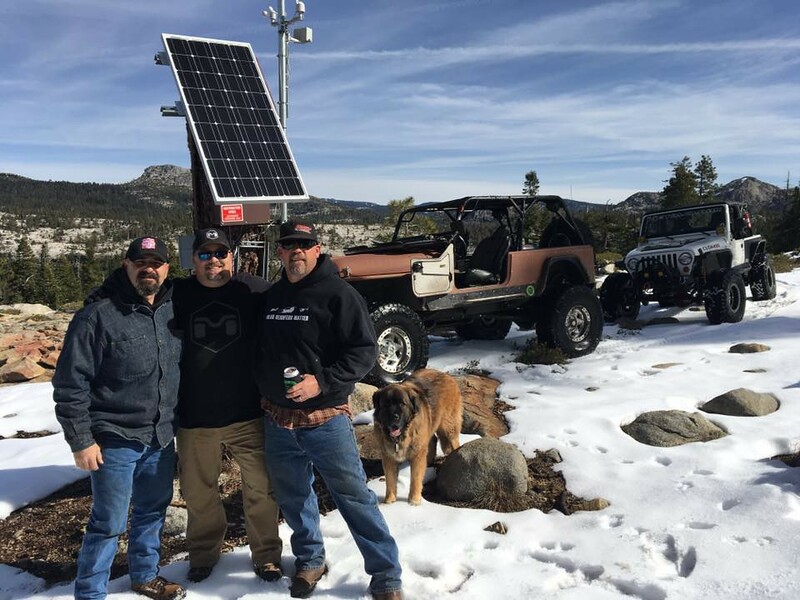 It is also completely off-grid and utlitilzes a modified USFS transmitter and is fed power via a solar array and backup battery system. In the winter months it is completely isolated due to snow and the Vue itself is inaccessible due to the deep snow pack. If you don't want to make the id public, I would appreciate a PM so I can track it personally. Our APRS ID is "CARSON". I'll try to respond to both with one post. WX is an Argent Data AD-WS1. This is a very nice setup that is relatively inexpensive with built in TNC. Just hook up to radio and go. Digipeater is An Alinco DR-135 with an Argent Data T3-135 board installed. The combo above allowed us to feed the WX data right to the Alinco/T3-135 and make for a very nice "All in one" WX/Digi. We also did a modification to the T3-135 so it would report voltage. Very important to remote sites running on solar. Solar system is pretty simple. 1x100 watt panel to a 20amp Windy Nation PWM charge controller with a good quality Deep Cycle AGM 12v battery. So far this has held up fine to the power usage. With that said the T3-135 has remote access abilities so we are able to turn the repeating function on and off to reduce power drain if needed. We can also set other parameters this way which is a God send in the winter time when the site is pretty much inaccessible. We actually have two APRS WX's in the same area. One at our Cabin and the other on the ridge with the digi. We didn't intend to have two in the same area but we needed the digi on the ridge to allow our WX at the cabin to "Get Out" so we installed a spare AD-WS1 at the digi also. The WX at the Cabin started out as a need to report Voltage from our solar there but morphed into weather stations and digipeaters. You know how it goes. We do have a couple of calibrations left to make but for the most part our temps/wind/rain/voltage are good. Hope this answers your questions. Have a great day. Yes, thanks for sharing! Here is the link to our CARSON site. We also are using telemetry data to show battery conditions. I see we are not too far apart and both connect via the K6CDF APRS link. I put the link to our station on my website. It is used by numerous organizations associated with the local area.